through "show me, don't tell me" advertising. ActionXL helped them reach their goal. The number of smartphones and tablets is growing at a dizzying pace. Google recently announced that more than 700,000 new Android devices are activated each day, with over 250 million active clients worldwide. Apple, as of Q4 2011, was selling over 400,000 iOS devices a day. Not surprisingly, most of these people are downloading applications that interest them. How do you build goodwill and credibility with this vast audience, and how do you capture your customer's attention? Give them a useful tool - for free. Johnson Level provided their audience with a useful application that doesn't use scrolling ads, banner ads, or popup screens, and gave it to them for free. Visual Level has been downloaded by over 27,000 people, with a retention rate of over 50%. Since Feb. 2010, Visual Level has been seen by over 30,000 people. More importantly, they found it useful enough to keep on their phones. 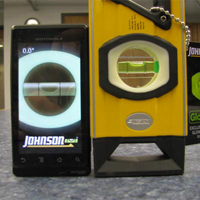 And each time they start Visual Level, Johnson Tools is remembered as the company who gave them this free app. And the numbers keep growing. Johnson Level & Tool Mfg. Co., Inc. has created good will and credibility with their customers, while creating new marketing and sales opportunities with a vast, new audience. "The first time I spoke to Jay O'Leary, ActionXL's President, I had the unmistakable feeling this was a person and company who would be a great business partner and a joy to work with. I could not have been more right. As CFO of Johnson Level & Tool, I have been working with ActionXL on smart phone applications since January 2010. For every project, Jay and his team truly acted as our partners, focusing on getting each application exactly right, not only from our perspective but also the smart phone user's, even after the application had been published. Not only do they stand behind their finished work in every way, they are also very proactive and involved on the front end, helping us to conceptualize how a new application will work and even doing some testing to confirm application viability before a project has even begun. It is so clear ActionXL values its customers and understands that they will only be successful when their customers see success. And the best part is you can tell they really love what they do; their enthusiasm is contagious. It will be our pleasure to continue to grow with ActionXL."